Human memory CD8+ T cell subsets, termed central memory and effector memory T cells, can be identified by expression of CD45RA, CD62 ligand (CD62L), and CCR7. Accordingly, functional differences have been described for each subset, reflecting unique roles in immunological memory. The common γ-chain cytokines IL-15 and IL-7 have been shown to induce proliferation and differentiation of human CD8+ T cell subsets, as well as increased effector functions (i.e., cytokines, cytotoxicity). In this study, we observed that addition of IL-15 or IL-7 to cultures of human CD8+ T cells profoundly enhanced the IL-12-IL-18 pathway of IFN-γ production. Importantly, IL-15 and IL-7 lowered the threshold concentrations of IL-12 and IL-18 required for induction of IFN-γ by 100-fold. Comparison of IL-15 and IL-7 demonstrated that IL-15 was superior in its ability to enhance IL-12-IL-18-induced IFN-γ, without evidence of a synergistic effect between IL-15 and IL-7. We also observed that IL-15- and IL-7-mediated enhancement of IL-12-IL-18-induced IFN-γ production was a functional property of effector memory CD8+ T cells. Despite a lack of association between cell division and acquisition of IL-12-IL-18-induced IFN-γ, down-regulation of CD62L expression correlated well with increased IL-12-IL-18-induced IFN-γ. Purified central memory T cells stimulated with IL-15 and IL-7 down-regulated CD62L and acquired potent IL-12-IL-18-induced IFN-γ similar to effector memory T cells. Thus, in addition to its known role in development of T cell memory, IL-15 may amplify memory CD8+ T cell effector functions by increasing sensitivity to proinflammatory cytokine stimulation. Human memory CD8+ T cell subsets with distinct phenotypes and effector functions have been characterized, and these T cell subsets are referred to as central memory (TCM)3 cells (CD62LhighCCR7highCD45RAlow) and effector memory (TEM) cells (CD62LlowCCR7lowCD45RAlow) (1, 2). A second population of CD45RA+ T effector memory cells (TEMRA) (CD62LlowCCR7lowCD45RAhigh), is typically observed only among CD8+ T cells, and the frequency of TEMRA cells increases with viral infections, homeostatic proliferation, and tumor responses (3, 4, 5, 6, 7, 8, 9). Functionally, CD8+ TEM and TEMRA cells demonstrate rapid effector functions such as cytokine production (i.e., IFN-γ) and cytotoxicity (1, 2). Although human TCM cells do not exhibit equivalent effector functions, they possess greater proliferative capacity and IL-2 production. Further understanding of the functional properties of these memory T cell subsets is necessary for vaccine development. Evaluation of effector functions (i.e., IFN-γ) is typically assayed after TCR stimulation. However, T cells also secrete IFN-γ in a TCR-independent manner after stimulation with the proinflammatory cytokines IL-12 and IL-18 (10, 11, 12, 13). This TCR-independent, cytokine-dependent pathway of IFN-γ production results from the synergistic actions of IL-12 and IL-18 (13) and is an important aspect of chronic inflammation, as well as the early innate immune response of CD8+ T cells before the development of Ag-specific immunity (14, 15, 16). IL-15, a member of the common γ chain (γc) family of cytokines, is important for the development and maintenance of CD8+ T cell memory (17, 18, 19). Paradoxically, studies have also shown that IL-15 induces CD8+ T cell differentiation and effector functions (20, 21, 22, 23, 24). For example, the increased availability of IL-15 and IL-7 after total body irradiation/lymphodepletion (due to the removal of cytokine “sinks”) results in increased effector functions of adoptively transferred antitumor CTLs. Thus, the role of IL-15 is not limited to the development of memory. In this study, we determined whether IL-15 impacted the IL-12-IL-18 pathway of IFN-γ secretion in human CD8+ T cell subsets. We report that both IL-15 and IL-7 significantly increase the number of IFN-γ+ CD8+ T cells, as well as IFN-γ secretion, obtained with IL-12-IL-18 stimulation. This result is in contrast to stimulation with IL-15 or IL-7 alone, which failed to induce significant IFN-γ. The effect was mediated mostly by IL-15, with no synergy between IL-15 and IL-7. We also report that the γc cytokines IL-15 and IL-7 increased sensitivity to IL-12-IL-18 stimulation by reducing the concentrations of IL-12-IL-18 required to induce IFN-γ. Enhanced IL-12-IL-18-induced IFN-γ was a functional property of terminally differentiated TEM/TEMRA cells, and down-regulation of CD62 ligand (CD62L) expression by TCM cells correlated with the acquisition of IL-12-IL-18-induced IFN-γ production. We propose that in addition to promoting the development of T cell memory, IL-15 synergizes with inflammation to enhance CD8+ T cell effector functions. These results have important implications in clinically relevant situations in which γc cytokines and concomitant inflammation may synergize to enhance T cell functions in vivo. Buffy coats from healthy human donors were provided by Virginia Blood Services (Richmond, VA). PBMC were obtained by Ficoll-Paque separation, followed by repeated washes with HBSS. PBMC were cultured overnight in tissue culture flasks at 37°C in RPMI 1640 medium containing 10% FBS before functional assays (complete RPMI 1640). For some experiments, CD8+ T cells were purified from nonadherent PBMC using the human CD8+ T cell Negative Isolation kit/MACS (Miltenyi Biotec) and LS columns according to the manufacturer’s instructions. Cell purities were >90% CD8+CD3+CD56−. Subsequent to column purification, CD8+ T cells were labeled with CFSE by incubating T cells at 50 million cells/ml in 5 μM CFSE/HBSS for 5 min at room temperature. Labeling was quenched by addition of an equal volume of neat FBS, followed by three washes in FBS-containing HBSS. Trypan blue exclusion was used to confirm the viability of the T cells after CFSE labeling. PBMC were cultured in 24-well plates at 2 million cells per well. Alternatively, purified CFSE-labeled CD8+ T cells were cultured at 2 million cells/ml. Cytokine-stimulated cultures received 25 ng/ml recombinant human IL-15 or IL-7, as well as various concentrations of recombinant human IL-12 and IL-18 (R&D Systems). For anti-CD3-stimulated cells, wells were precoated with 10 μg/ml anti-human CD3 Ab (HIT3; BioLegend) and washed extensively before addition of cells. Alternatively, soluble anti-CD3 was added to PBMC cultures at 0.5 μg/ml. Cells were cultured in complete RPMI 1640 at 37°C for 24, 48, and 72 h before collection and preparation for FACS analysis. Approximately 8–10 h before cells were harvested for FACS, monensin solution (BioLegend) was added to allow the accumulation and detection of intracellular cytokine. Cultured cells were collected and washed with PBS containing 2% FBS. Before addition of fluorescent Abs, cells were incubated with purified anti-CD32 Ab (BioLegend) to reduce nonspecific binding via FcRs. Cells were sequentially incubated with FITC anti-human CD62L (BD Pharmingen), PE anti-human CD45RA (BioLegend), energy-coupled dye anti-human CD8α (Beckman Coulter), and either PE-Cy7 anti-human CCR7 or PE-Cy7 anti-human CD3 (BD Pharmingen). Cells were washed with PBS/FBS to remove unbound Ab. For intracellular cytokine staining, fluorescently labeled cells were first fixed with 4% formaldehyde. Fixed cells were washed and permeabilized using 1× Perm/Wash buffer (BioLegend), then incubated with allophycocyanin anti-human IFN-γ or an appropriate isotype control diluted in Perm/Wash buffer (BioLegend). Cells were washed and finally resuspended in PBS/FBS. Five-color FACS analysis of CD3+CD8αhigh cells was performed on the Beckman Coulter FC500 instrument with data analysis using the CXP software package. After overnight adherence and purification of CD8+ T cells by MACS, CD8+ T cells were incubated with purified anti-CD32 Ab/PBS/2% FBS to block nonspecific binding to FcRs. Cells were then stained with anti-CD62L FITC, anti-CD8 PE, and anti-CD45RA allophycocyanin (BD Pharmingen) Abs in PBS/2% FBS on ice for 30 min. Cells were washed twice with cold PBS/2% FBS and then resuspended in complete medium for FACS sorting. High-speed, single cell FACS sorting was performed at the National Institutes of Health (Bethesda, MD) on a BD FACSAria equipped with a four-way sorter, in which naive (CD62L+CD45RA+), TCM (CD62L+CD45RA−), TEM (CD62L−CD45RA−), and TEMRA (CD62L−, CD45RA+) subsets were sorted to >98% purity. Sorted cells were allowed to rest overnight in complete RPMI 1640 medium before culture with cytokines. One-way ANOVA, as well as Tukey-Kramer multiple comparison posttest, were performed using data from all donors analyzed by GraphPad InStat version 3.0a for Macintosh (www.graphpad.com). A value of p < 0.01 was considered significant. Previous studies showed that culture of human CD8+ T cells with IL-15 and IL-7 induced proliferation and acquisition of effector functions (6, 25). To evaluate function with respect to IL-12-IL-18-induced IFN-γ, we measured the ex vivo response of CD8+ T cells to these cytokines, as well as the effect of IL-15 and IL-7 on this pathway. We routinely observed a low but detectable number of IFN-γ+ CD8+ T cells after stimulation with IL-12 and IL-18 compared with the number of cells found from stimulation with medium alone. However, this difference was not statistically significant. Stimulation with IL-15 and IL-7 failed to induce a significant number of IFN-γ+ T cells relative to medium, which is in contrast to reports that IL-15 can directly induce IFN-γ (26). However, the addition of IL-15 and IL-7 to IL-12-IL-18-stimulated cultures (referred to as Quadra stimulation) profoundly increased the number of IFN-γ+ cells (Fig. 1⇓). T cells expressing IFN-γ after anti-CD3 stimulation were used as a comparison. Among six donors tested, 45–85% of CD8αhighCD3+CD56− T cells were IFN-γ+ after addition of IL-15 and IL-7 to cultures (p < 0.001 for Quadra stimulation relative to medium) (Fig. 1⇓). The γc cytokines IL-15 and IL-7 profoundly enhance the IL-12-IL-18 pathway of IFN-γ production in human CD8+ T cells. PBMC were cultured for 48 h in complete medium, IL-15-IL-7 (25 ng/ml each), IL-12-IL-18 (10 and 50 ng/ml, respectively), both IL-15-IL-7 and IL-12-IL-18 (Quadra stimulation), or anti-CD3. Cells were stained for surface CD8 and intracellular IFN-γ expression and analyzed by FACS. Data from six healthy donors were compiled and analyzed using one-way ANOVA with Tukey-Kramer multiple comparison posttest (InStat3 software). Data represent the mean percentage of CD8+ T cells that are IFN-γ+ based on intracellular cytokine secretion detection, and error bars show SD among donors indicated. Due to the significant increase in the number of IFN-γ+ CD8+ T cells with the addition of IL-15-IL-7 to IL-12-IL-18-stimulated cultures, we performed titration experiments to determine whether IL-15-IL-7 lowered the concentrations of IL-12 and IL-18 required to induce IFN-γ. Indeed, after 48 h of stimulation, we observed that addition of IL-15-IL-7 to cultures reduced the threshold required for IL-12-IL-18-induced IFN-γ by 2 logs (Fig. 2⇓). 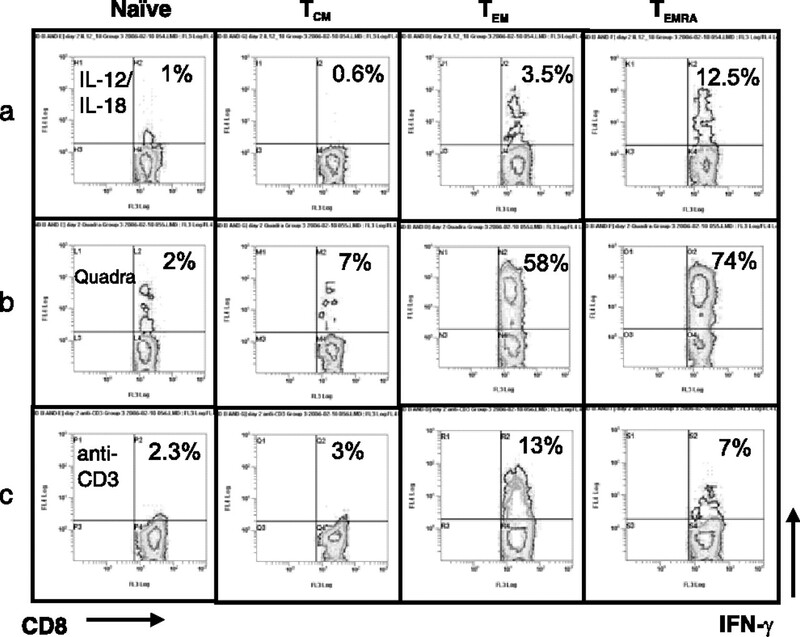 Addition of 10 ng/ml IL-12 and 50 ng/ml IL-18 induced a modest increase in the number of IFN-γ+ CD8+ T cells, and this response was undetectable at lower concentrations of IL-12-IL-18. Conversely, stimulation with IL-15-IL-7 did not induce a significant number of IFN-γ-producing CD8+ T cells. However, addition of IL-15-IL-7 lowered the concentrations of IL-12 and IL-18 required to achieve a significant IFN-γ response to as low as 0.1 ng/ml IL-12 and 1 ng/ml IL-18 (Fig. 2⇓c). Data summary obtained from six healthy donors is shown in Fig. 2⇓ in which 10 ng/ml (p < 0.001) (Fig. 2⇓a), 1 ng/ml (Fig. 2⇓b), and 0.1 ng/ml (Fig. 2⇓c) concentrations of IL-12 were tested relative to medium. These data demonstrate that IL-15-IL-7 not only increase IL-12-IL-18-induced IFN-γ production, but also lower the threshold concentrations required to induce IFN-γ. Increased responsiveness to IL-12 stimulation may be an important function of IL-15 in promoting T cell effector functions. IL-15 and IL-7 lower the threshold required for IL-12-IL-18-induced IFN-γ production from peripheral blood CD8+ T cells. PBMC from healthy human donors were cultured for 48 h with medium alone, IL-12-IL-18 at decreasing concentrations (10/50 ng/ml IL-12-IL-18, respectively (a), and 1/10 ng/ml, 0.1/1 ng/ml (c)), IL-15-IL-7 alone (25 ng/ml each), or IL-15-IL-7 and decreasing concentrations of IL-12 and IL-18 (Quadra stimulation). Cells were harvested and analyzed for intracellular IFN-γ production by FACS. The percentage represents IFN-γ+ cells among gated CD8+ T cells. Data from six healthy donors were compiled and analyzed using one-way ANOVA with Tukey-Kramer multiple comparison posttest (InStat3 software). Data represent the mean percentage of CD8+ T cells that are IFN-γ+ based on intracellular cytokine secretion detection, and error bars represent SD among donors indicated. A value for p indicates the significance of cytokine stimulation compared with medium alone (no stimulation). Data shown in Figs. 1⇑ and 2⇑ were obtained from cultures in which both IL-15 and IL-7 were included, based on previous research that showed functional effects of these cytokines on CD8+ T cells (i.e., proliferation) (6). Because of the magnitude of increase in the number of IFN-γ+ cells, we wanted to determine whether IL-15 or IL-7 differed with respect to potency in enhancing IL-12-IL-18-induced IFN-γ; or alternatively, whether there were synergistic effects between IL-15 and IL-7. For these experiments, we cultured PBMC with IL-12-IL-18 in the presence of either IL-15 (Tri-15) or IL-7 (Tri-7) for 72 h. Again, culture with IL-12-IL-18 (no IL-15 or IL-7) induced a small but significant number of IFN-γ+ CD8+ T cells (Fig. 3⇓a) in three individual donors shown. Similar to the combination of IL-15 and IL-7 (Figs. 1⇑ and 2⇑), culture with either IL-15 or IL-7 did not induce significant IFN-γ production from CD8+ T cells in the absence of proinflammatory cytokines (Fig. 3⇓a). Addition of either IL-15 (Tri-15) or IL-7 (Tri-7) to IL-12-IL-18-stimulated cultures significantly enhanced IFN-γ production. However, we found that at equivalent concentrations IL-15 was superior to IL-7 based on the number of IFN-γ+ cells, which was on average 50% more than Tri-7-stimulated cultures. Importantly, there was no synergistic effect between IL-15 and IL-7, as the number of IFN-γ+ CD8+ T cells obtained with Tri-15 stimulation was equivalent to the number obtained with Quadra stimulation. A summary of the data obtained from five healthy donors is shown Fig. 3⇓b (p < 0.001 for Quadra and Tri-15 stimulation; p < 0.05 for Tri-7 stimulation relative to medium; p < 0.05 for Tri-15 vs Tri-7 stimulation). There was no statistical difference between Tri-15 and Quadra stimulation. Therefore the effect of IL-15-IL-7 on the enhancement of the IL-12-IL-18 pathway of IFN-γ production is primarily due to IL-15. Potent effect of IL-15 on enhancement of IL-12-IL-18-induced IFN-γ production. a, Human PBMC were cultured for 72 h in the presence of medium alone, IL-12-IL-18 (10 and 50 ng/ml, respectively), IL-15 only, IL-7 only, IL-15-IL-7, or IL-12-IL-18 with IL-15 (Tri-15 stimulation), IL-7 (Tri-7 stimulation), or both IL-15 and IL-7 (Quadra stimulation). Cells were harvested and analyzed for intracellular IFN-γ production by FACS. Percentage of IFN-γ+ cells among gated CD8+ T cells is presented. Data from three individual donors are shown. b, The results of five donors are shown. Data represent the mean percentage of CD8+ T cells that are IFN-γ+ based on intracellular cytokine secretion detection, and error bars represent SD among donors indicated. A value for p indicates the significance of cytokine stimulation compared with medium alone (no stimulation), as well as a comparison between Quadra, Tri-15, and Tri-7 cytokine stimulations. Previous experiments showed that the γc cytokines IL-15 and IL-7 could enhance the IL-12-IL-18 pathway of IFN-γ production in bulk CD8+ T cells. Because human memory CD8+ T cell subsets with different functional capacities have been described, we wanted to determine whether memory CD8+ T cells differed in their response to these cytokines. We used CD45RA vs CD62L expression to analyze IFN-γ production in naive, TCM, TEM, and TEMRA subsets after 48 h stimulation with either medium, immobilized anti-CD3, IL-12-IL-18, or IL-12-IL-18 and IL-15-IL-7 (Quadra stimulation). With anti-CD3 stimulation, a significant percentage of CD8+ TEM were IFN-γ+ (Fig. 4⇓c), consistent with published data (2). In contrast, a significant number of TEMRA were IFN-γ+ after IL-12-IL-18 stimulation (Fig. 4⇓a; 12.5%) in one representative donor. Importantly, we did not detect any significant ex vivo response of TCM to IL-12-IL-18 stimulation (Fig. 4⇓a). As expected, the addition of IL-15-IL-7 had a profound effect on the overall number of IFN-γ+ cells. However, the effect was most evident in TEM and TEMRA subsets (Fig. 4⇓b; 58 and 74%, respectively). In contrast, TCM did not show a similar increase in IFN-γ production after 48 h. This is consistent with reports that TCM exhibit low TCR-induced effector functions ex vivo (1, 27). Thus, these data show that TEMRA possess IL-12-IL-18-induced IFN-γ production ex vivo, and that IL-15-IL-7 enhances this production in both TEM and TEMRA subsets. IL-12-IL-18-induced IFN-γ in CD8+ memory T cell subsets. Human PBMC were cultured with IL-12-IL-18 (10 and 50 ng/ml, respectively) (a) in addition to IL-15 and IL-7 (b), or with immobilized anti-CD3 only (c) for 48 h. Cells were harvested and stained for FACS. Percentages (upper right quadrant) represent the IFN-γ+ naive (defined as CD62LhighCD45RAhigh), TCM (CD62LhighCD45RAlow), TEM (CD62LlowCD45RAlow), and TEMRA (CD62LlowCD45RAhigh) CD8αhighCD3+ T cells. Results of one donor of four are represented. We failed to detect significant IL-12-IL-18-induced IFN-γ, or IL-15-IL-7-mediated enhancement of this pathway among CD8+ TCM after 48 h of stimulation. However, the γc cytokines IL-15 and IL-7 are known to induce proliferation and subsequent differentiation of memory CD8+ T cell subsets. Therefore we wanted to determine whether there was a correlation between IL-15-IL-7-induced proliferation, differentiation, and acquisition of IL-12-IL-18-induced IFN-γ production. CD8+ T cells were purified by negative selection and subsequently labeled with CFSE. 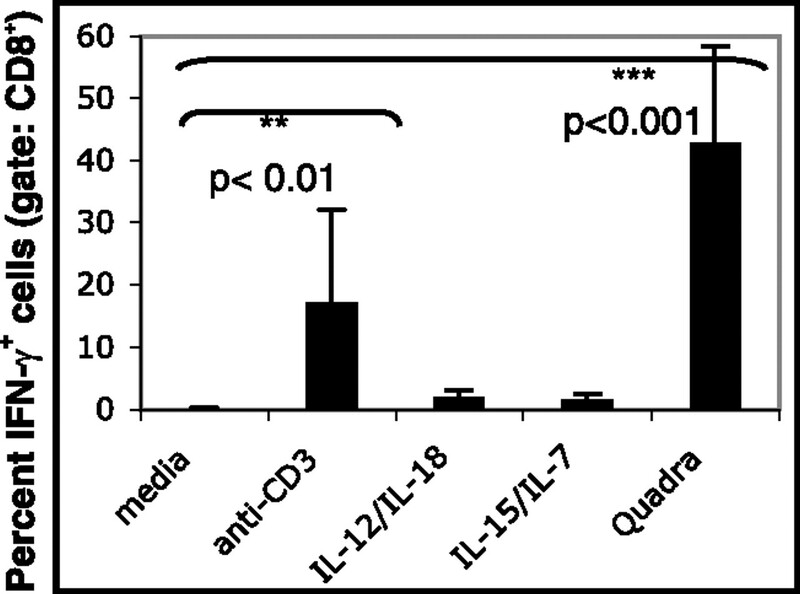 Labeled CD8+ T cells were cultured for 72 h with IL-15-IL-7 in the presence or absence of IL-12-IL-18. As shown in Fig. 5⇓, a and b, a small but significant number of CD8+ T cells divided in response to cytokine stimulation (3.9% medium control vs 18.1% with Quadra stimulation). We expected greater proliferation based on previous reports that showed extensive CD8+ T cell proliferation in response to IL-15. We suspected that the 7-day culture period used in these studies explained the observed differences. To confirm this suspicion, we measured CD8+ T cell proliferation after culture with cytokines for 2, 3, and 6 days. Indeed, we found a significant difference in the number of cells that had divided after 6 days as opposed to 3 days (Fig. 5⇓, b and c; 18.1 vs 81.8%). However, IL-15-mediated enhancement of IL-12-IL-18-induced IFN-γ was evident as early as 48 h of stimulation, despite limited proliferation. Therefore we performed experiments to simultaneously measure CFSE dilution (as a function of cell division/proliferation) and expression of CD62L (as a measure of CD8+ T cell differentiation). As shown in Fig. 5⇓d (a donor different from donors found in Fig. 5⇓, a–c), purified CD8+ T cells cultured with medium alone exhibited minimal proliferation (3.2%). Gating on either CD62L+ (Fig. 5⇓e) or CD62L− (Fig. 5⇓f) CD8+ T cell populations showed no IFN-γ expression, as expected for unstimulated cells. 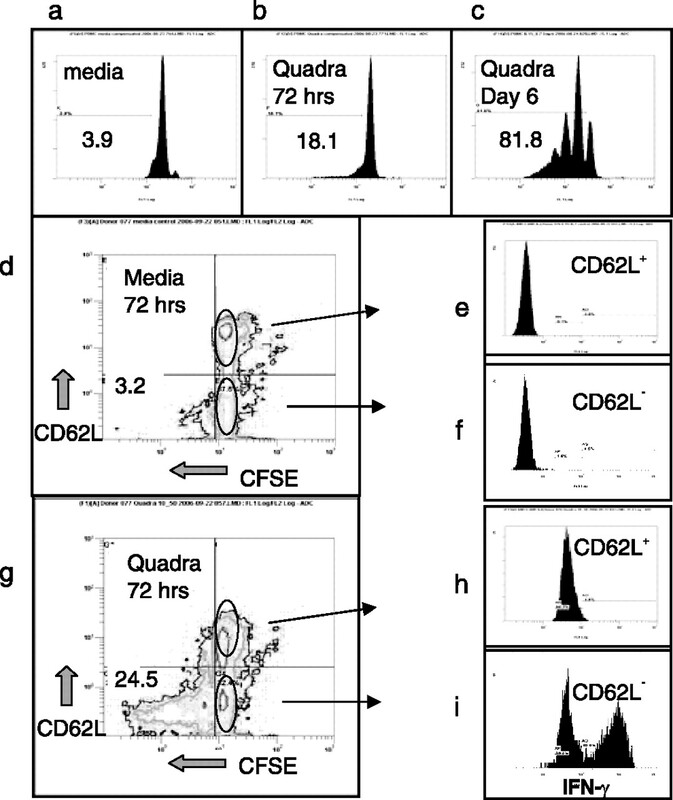 With Quadra stimulation, a significant increase was observed in the number of divided cells, and almost all of the divided cells were CD62L− (24.5% of total CD8+ T cells, 95% of divided CD8+ T cells) (Fig. 5⇓g). Although the relative number of CD62L+ CD8+ T cells observed between unstimulated and stimulated cultures was comparable, there was a substantial decrease in the mean fluorescence intensity of CD62L expression in the CD62L+ population, suggesting a transition from CD62L+ to CD62L− as the result of IL-15-driven differentiation. When these two subsets were analyzed for IFN-γ production, we found that both CD62L+ and CD62L− CD8+ T cells were IFN-γ+ after 72 h of culture, regardless of whether the cells had divided or not (Fig. 5⇓, d and g). This is in contrast to what was observed after 48 h of culture, when TCM did not yet express IFN-γ (Fig. 4⇑). Nevertheless, only CD62L− T cells expressed IFN-γhigh and IFN-γlow (Fig. 5⇓i), whereas CD62L+ cells were solely IFN-γlow (Fig. 5⇓h). These data show that cell division is not required for IL-15-IL-7 to enhance or induce the IL-12-IL-18 pathway of IFN-γ production in memory CD8+ T cells. However, cell division could enhance IFN-γ production as the number of IFN-γhigh cells increased among divided CD62L− cells relative to nondivided CD62L− cells (data not shown). Furthermore, these data suggest that γc cytokine-induced differentiation of TCM is accompanied by induced responsiveness to IL-12-IL-18 stimulation. Lack of correlation between cell division and IL-15-IL-7-induced functional responsiveness to IL-12-IL-18. Human CD8+ T cells were purified from PBMC by negative selection and labeled with CFSE. Cells were cultured in complete medium (a, d, e, and f) or with Quadra stimulation (b, c, g, h, and i) for either 72 h (a, b, and d–i) or 6 days (c) and subsequently stained for surface CD62L expression (d and g) and intracellular IFN-γ production (e, f, h, and i). Results of one representative donor are shown. The data presented in Fig. 5⇑ suggest that as TCM differentiate into TEM/TEMRA over time (based on the down-regulation of CD62L expression), they acquire responsiveness to IL-12-IL-18 stimulation, However, to definitely show that these are the same cells undergoing differentiation, we purified CD8+ memory T cell subsets before in vitro culture. FACS-purified TCM, TEM, and TEMRA subsets were cultured for 72 h (postsort) with medium, IL-12-IL-18, IL-15-IL-7, or Quadra stimulation. Cells cultured with IL-15-IL-7 alone did not secrete significant quantities of IFN-γ (<40 pg/ml; data not shown), consistent with data obtained by intracellular cytokine detection. As expected, culture of TEMRA and TEM with IL-12-IL-18 resulted in a mean of 1084 and 452 pg/ml IFN-γ production, respectively (Fig. 6⇓), as shown in four donors studies. However, addition of IL-15-IL-7 to these cultures profoundly increased IFN-γ secretion (>100,000 pg/ml). Although TCM secreted low amounts of IFN-γ with IL-12/-IL-18 stimulation, the addition of IL-15-IL-7 enhanced IFN-γ production to levels that were comparable to those of TEM and TEMRA (mean, 97,460 pg/ml). Therefore, prolonged culture of TCM with IL-15-IL-7 induced functional responses to IL-12-IL-18 that were similar to those of TEM and TEMRA. To determine whether TCM resembled TEM/TEMRA phenotypically after the 3-day culture, we analyzed sorted TCM by FACS for expression of CD62L and CD45RA. TCM remained negative for CD45RA expression after Quadra stimulation. Despite an increase in the number of CD62L− TCM, a majority remained CD62L+. Importantly however, the mean fluorescence intensity of CD62L expression of those cells that were CD62L+ had decreased by 50% (our unpublished observations), suggesting that cells were actively undergoing differentiation. This observation is similar to that observed for bulk CD8+ T cells (Fig. 5⇑). Therefore, transition from TCM into TEM is accompanied by an increase in IL-12-IL-18-mediated IFN-γ secretion, although complete differentiation into TEM/TEMRA is not a prerequisite for IL-12-IL-18 functional responsiveness. Functional responsiveness of FACS-purified memory CD8+ T cell subsets. Column-purified CD8+ T cells were stained with fluorescent Abs to CD62L and CD45RA, then FACS-sorted into individual TCM (CD62LhighCD45RAlow), TEM (CD62LlowCD45RAlow), and TEMRA (CD62LlowCD45RAhigh) subsets using a BD FACSAria instrument. 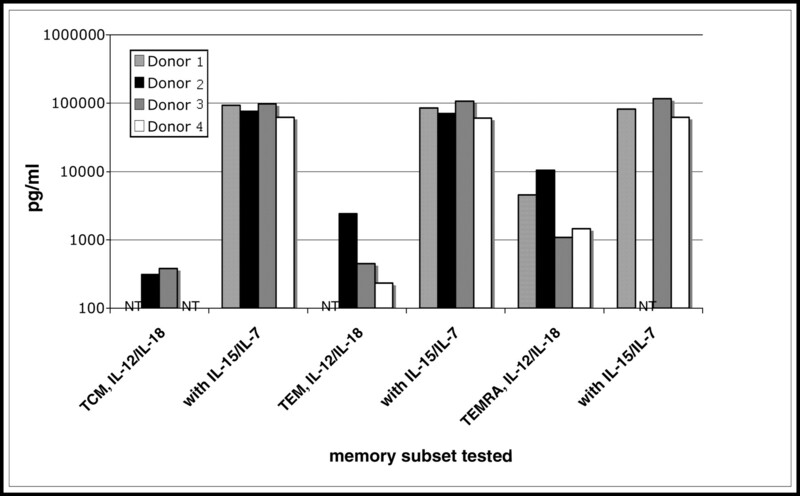 Memory subsets were rested overnight in complete medium, then cultured with medium, IL-12-IL-18 (10 and 50 ng/ml, respectively), or Quadra stimulation. Supernatants were harvested after 72 h and tested for IFN-γ by ELISA. Results for four healthy human donors are shown. NT, Not tested. Members of the common γc family of cytokines, particularly IL-15 and IL-7, can have multiple effects on T cell function, including the development and maintenance of memory. Paradoxically, IL-15 has also been shown to promote differentiation and acquisition of effector functions, and has been implicated in enhancement of antitumor functions in vivo (21, 23). Although some studies suggest that IL-15 directly stimulates IFN-γ production, this remains a controversial issue. Culture of human CD8+ T cells with IL-15 led to IFN-γ production, but only after PMA/ionomycin restimulation (25). Another study reported that IL-15 induced IFN-γ secretion from memory CD8+ T cells (26). However, CD56+CD16− cells (which includes NKT cells) were not depleted from the starting cell population, and 5–10% of the cells were not memory CD8+ T cells. Therefore it is possible that contaminating NK/NKT cells secreted IFN-γ when cultured with IL-15. Alternatively, the higher concentration of IL-15 used in (26) could have induced IFN-γ. We found detection of intracellular cytokine secretion by FACS to be a valuable and necessary approach for studies presented in this experiment because we could gate specifically on CD8αhighCD3+CD56−CD16− T cells. Because of the possibility of a small number of contaminating cells in CD8+ column-purified populations (which were 90–95% pure), we only measured IFN-γ in culture supernatants from FACS-sorted cells. A study (28) in mice reported that IL-15 in itself could not directly induce IFN-γ secretion, which is in agreement with our observations. We hypothesize that IL-15 is necessary, but not sufficient to induce CD8+ T cell effector functions. We propose that IL-15 (and possibly other γc cytokines) synergize with proinflammatory cytokines (or TCR stimulation) to amplify effector functions, particularly IFN-γ production. To test this hypothesis in vitro, we cultured CD8+ T cells with IL-12 and IL-18, two proinflammatory cytokines strongly associated with the innate immune response and chronic inflammation. IL-12 and IL-18 synergize to activate a potent TCR-independent pathway of IFN-γ production via activation of multiple elements of the human IFN-γ promoter (13). This TCR-independent pathway of IFN-γ production has been well documented for both CD4+ and CD8+ T cells derived from both humans and mice. We observed that human CD8+ TEMRA cells expressed IL-12-IL-18-dependent IFN-γ production ex vivo, without any prior in vitro conditioning (i.e., TCR stimulation) (Fig. 4⇑). This result is in contrast to anti-CD3-induced IFN-γ production, which was mainly within TEM. Thus, TEMRA can be functionally discriminated from TEM and TCM by their ex vivo response to IL-12 and IL-18 stimulation. We confirmed our results obtained by FACS analysis of intracellular IFN-γ by testing culture supernatants of FACS-purified TEMRA (Fig. 6⇑). Furthermore, we found that addition of IL-15 or IL-7 or both had a significant enhancing effect on the number of IFN-γ+ T cells induced by IL-12 and IL-18 stimulation (Fig. 1⇑). These results are in contrast to a published report (14) in which a modest effect was observed by addition of IL-15 to murine cultures. The reasons for this discrepancy could reflect the overnight culture with cytokines, a difference between mouse splenic T cells and human peripheral blood T cells, or a difference in the potency of IL-15-IL-15Rα stimulation in humans and mice. In support of the former, we also observed that the ability of IL-15 to enhance IFN-γ production was weak but detectable at 24 h. Nevertheless, the parallels between the two studies suggest an important conserved functional response that is not insignificant, with recent efforts to use IL-15 as a therapeutic agent (see below). A comparison between IL-15 and IL-7 showed that IL-15 was more potent in enhancing IFN-γ production, and there was no synergy between IL-15 and IL-7 (Fig. 3⇑). This latter result is in contrast to a report showing synergy between IL-15 and IL-21 (which also uses the γc receptor) in TCR-induced IFN-γ (22). Of particular importance and possible relevance in vivo, we show that IL-15 and IL-7 decreased the concentrations of IL-12 and IL-18 required for induction of IFN-γ by 100-fold (Fig. 2⇑). Although short-term culture of CD8+ T cells with IL-15/IL-7 enhanced IL-12-IL-18-induced IFN-γ in TEM and TEMRA subsets, prolonged culture with IL-15 and IL-7 (>72 h) generated both IFN-γhigh (CD62L+) and IFN-γlow (CD62L+ and CD62L−) populations (Fig. 5⇑). This result is in apparent contrast to findings published in another report (14), in which murine CD62L+ memory T cells expressed IFN-γ after overnight culture with Leishmania-infected macrophages. It is difficult to reconcile these data because only the number of IFN-γ+ cells is shown in (14), not the relative levels of IFN-γ secretion among CD62L+ and CD62L− cells. In addition, the use of IL-2 instead of IL-15 may change the kinetics of appearance of IFN-γ expression in CD62L+ cells. Alternatively, other signals generated in response to infection may alter the immediate T cell response to cytokines. Finally, there could be a fundamental difference between CD62L+ memory T cells in mice and those found in humans, but we do not yet fully understand those differences. Surprisingly, cell division was not required for the appearance of IFN-γlowCD62Lhigh cells (Fig. 5⇑). This suggests that memory CD8+ T cells, particularly the TCM subset, can rapidly acquire effector functions before extensive proliferation. Furthermore, complete differentiation of CD62L+ TCM into CD62L− TEM/TEMRA is not a prerequisite for IL-12-IL-18-induced IFN-γ. However, by day 3, TCM had significantly down-regulated CD62L expression, indicating active differentiation and transition into TEM/TEMRA. This emphasizes the point that analysis of TCM should be performed by gating on only the CD62Lhigh cells because inclusion of cells that are CD62L+ but express intermediate levels of CD62L may include cells in the TCM to TEM/TEMRA transition. Therefore as T cells undergo differentiation from CD62Lhigh TCM to CD62Llow TEM/TEMRA, they acquire functional responsiveness to IL-12 and IL-18. Because cell division was not required for acquisition of IL-12-IL-18-induced IFN-γ, we believe IL-15-enhanced expression of IL-12 and IL-18 receptors may be the mechanism for this enhancement. A recent report would support this conclusion (29). In addition, we (our unpublished observations) and others (30) have observed increased IL-18Rα expression among TEM. We believe these data to be highly relevant in the treatment of tumors, where IL-2 and IL-12 have been shown to be efficacious (31). These cytokines however, have toxicities primarily due to vascular leak syndrome (32). Theoretically, substitution of IL-15 for IL-2 would permit lower therapeutic doses of IL-12 to be used, yet still achieve potent T cell effector functions and antitumor memory. The γc cytokines can enhance the effector functions of tumor-specific CD8+ T cells when adoptively transferred into lymphopenic hosts, and a majority of these effects are attributed to increased availability of IL-15 and IL-7 due to the absence of cells that act as cytokine sinks (24). However, irradiation/lymphodepletion can result in transient expression of proinflammatory cytokines, thus creating an environment suitable for increased T cell effector function by the synergistic actions of γc cytokines and inflammation (33). In addition to adoptive immunotherapy of tumors, IL-15 may play a critical role in the early innate immune response to pathogens by amplifying the effects of proinflammatory cytokines. Numerous reports have demonstrated that memory CD8+ T cells can secrete IFN-γ in response to IL-12 and IL-18 induced by bacterial/viral infection, before the development of Ag-specific immunity (14, 34, 35). Therefore, IL-15, which is expressed in multiple tissues and whose expression may be linked to signals generated through TLRs, may help to amplify the response of T cells to proinflammatory cytokines before their peak expression (36, 37, 38, 39). Thus, the role of IL-15 may serve to not only promote CD8+ T cell memory, but also to amplify the responses to early infection and chronic inflammation. In the case of infection by a foreign pathogen, this role would be beneficial, whereas in the case of autoimmunity it could be detrimental. Studies are underway to further characterize this amplification of CD8+ T cell responses. I thank Dr. Dan Conrad (Virginia Commonwealth University) for helpful discussion and careful reading of this manuscript. I also acknowledge Dr. Kevin Holmes and Cal Eigsti at the National Institutes of Health for excellent technical assistance and helpful discussion. A special thank you to Patricia, Corbin, and Makenna, without whom this work would not be possible. The author has no financial conflict of interest. ↵1 This work was supported by funds provided by Virginia Commonwealth University and Department of Microbiology and Immunology, as well as a grant from the Thomas F. and Kate Miller Jeffress Memorial Trust. ↵3 Abbreviations used in this paper: TCM, central memory T cell; TEM, effector memory T cell; TEMRA, CD45RA+ T effector memory; γc, common γ-chain; CD62L, CD62 ligand. Sallusto, F., J. Geginat, A. Lanzavecchia. 2004. Central memory and effector memory T cell subsets: function, generation, and maintenance. Annu. Rev. Immunol. 22: 745-763. Sallusto, F., D. Lenig, R. Förster, M. Lipp, A. Lanzavecchia. 1999. Two subsets of memory T lymphocytes with distinct homing potentials and effector functions. Nature 401: 708-712. Chaux, P., V. Vantomme, P. Coulie, T. Boon, P. van der Bruggen. 1998. Estimation of the frequencies of anti-MAGE-3 cytolytic T-lymphocyte precursors in blood from individuals without cancer. Int. J. Cancer 77: 538-542.
von Holzen, U., M. Adamina, M. Bolli, W. P. Weber, P. Zajac, C. Groeper, A. Reschner, C. Feder, R. Schumacher, W. Marti, et al 2005. Selective responsiveness to common γ chain cytokines in peripheral blood-derived cytotoxic T lymphocytes induced by Melan-A/MART-127–35-targeted active specific immunotherapy. Int. J. Cancer 115: 248-255. Anichini, A., A. Scarito, A. Molla, G. Parmiani, R. Mortarini. 2003. Differentiation of CD8+ T cells from tumor-invaded and tumor-free lymph nodes of melanoma patients: role of common γ-chain cytokines. J. Immunol. 171: 2134-2141.
van Leeuwen, E. M., L. E. Gamadia, P. A. Baars, E. B. Remmerswaal, I. J. ten Berge, R. A. van Lier. 2002. Proliferation requirements of cytomegalovirus-specific, effector-type human CD8+ T cells. J. Immunol. 169: 5838-5843. Dunne, P. J., J. M. Faint, N. H. Gudgeon, J. M. Fletcher, F. J. Plunkett, M. V. Soares, A. D. Hislop, N. E. Annels, A. B. Rickinson, M. Salmon, A. N. Akbar. 2002. Epstein-Barr virus-specific CD8+ T cells that re-express CD45RA are apoptosis-resistant memory cells that retain replicative potential. Blood 100: 933-940. Tomura, M., S. Maruo, J. Mu, X.-Y. Zhou, H.-J. Ahn, T. Hamaoka, H. Okamura, K. Nakanishi, S. Clark, M. Kurimoto, H. Fujiwara. 1998. Differential capacities of CD4+, CD8+, and CD4−CD8− T cell subsets to express IL-18 receptor and produce IFN-γ in response to IL-18. J. Immunol. 160: 3759-3765. Carter, L. L., K. M. Murphy. 1999. Lineage-specific requirement for signal transducer and activator of transcription (Stat)4 in interferon γ production from CD4+ versus CD8+ T cells. J. Exp. Med. 189: 1355-1360. Yang, J., T. L. Murphy, W. Ouyang, K. M. Murphy. 1999. Induction of interferon-γ production in Th1 CD4+ T cells: evidence for two distinct pathways for promoter activation. Eur. J. Immunol. 29: 548-555. Barbulescu, K., C. Becker, J. F. Schlaak, E. Schmitt, K.-H. Meyer zum Buschenfelde, M. F. Neurath. 1998. Cutting edge: IL-12 and IL-18 differentially regulate the transcriptional activity of the human IFN-γ promoter in primary CD4+ T lymphocytes. J. Immunol. 160: 3642-3647. Berg, R. E., C. J. Cordes, J. Forman. 2002. Contribution of CD8+ T cells to innate immunity: IFN-γ secretion induced by IL-12 and IL-18. Eur. J. Immunol. 32: 2807-2816. Berenson, L. S., N. Ota, K. M. Murphy. 2004. Issues in T-helper 1 development: resolved and unresolved. Immunol. Rev. 202: 157-174. Uno, K., Y. Mitsuishi, M. Tanigawa, K. Okuno, N. Hirai, Y. Mizutani, H. Saotome, H. Fujiwara, T. Kishida. 2003. A series of immune responses leading to the induction of T cell IL-12/IL-18 responsiveness in patients with relatively large tumor burdens. Cancer Immunol. Immunother. 52: 33-40. Schluns, K. S., K. Williams, A. Ma, X. X. Zheng, L. Lefrançois. 2002. Cutting edge: requirement for IL-15 in the generation of primary and memory antigen-specific CD8 T cells. J. Immunol. 168: 4827-4831. Yajima, T., H. Nishimura, W. Wajjwalku, M. Harada, H. Kuwano, Y. Yoshikai. 2002. Overexpression of interleukin-15 in vivo enhances antitumor activity against MHC class I-negative and -positive malignant melanoma through augmented NK activity and cytotoxic T-cell response. Int. J. Cancer 99: 573-578. Klebanoff, C. A., L. Gattinoni, P. Torabi-Parizi, K. Kerstann, A. R. Cardones, S. E. Finkelstein, D. C. Palmer, P. A. Antony, S. T. Hwang, S. A. Rosenberg, et al 2005. Central memory self/tumor-reactive CD8+ T cells confer superior antitumor immunity compared with effector memory T cells. Proc. Natl. Acad. Sci. USA 102: 9571-9576. Zeng, R., R. Spolski, S. E. Finkelstein, S. Oh, P. E. Kovanen, C. S. Hinrichs, C. A. Pise-Masison, M. F. Radonovich, J. N. Brady, N. P. Restifo, et al 2005. Synergy of IL-21 and IL-15 in regulating CD8+ T cell expansion and function. J. Exp. Med. 201: 139-148. Klebanoff, C. A., S. E. Finkelstein, D. R. Surman, M. K. Lichtman, L. Gattinoni, M. R. Theoret, N. Grewal, P. J. Spiess, P. A. Antony, D. C. Palmer, et al 2004. IL-15 enhances the in vivo antitumor activity of tumor-reactive CD8+ T cells. Proc. Natl. Acad. Sci. USA 101: 1969-1974. Gattinoni, L., S. E. Finkelstein, C. A. Klebanoff, P. A. Antony, D. C. Palmer, P. J. Spiess, L. N. Hwang, Z. Yu, C. Wrzesinski, D. M. Heimann, et al 2005. Removal of homeostatic cytokine sinks by lymphodepletion enhances the efficacy of adoptively transferred tumor-specific CD8+ T cells. J. Exp. Med. 202: 907-912. Liu, K., M. Catalfamo, Y. Li, P. A. Henkart, N. P. Weng. 2002. IL-15 mimics T cell receptor crosslinking in the induction of cellular proliferation, gene expression, and cytotoxicity in CD8+ memory T cells. Proc. Natl. Acad. Sci. USA 99: 6192-6197. Lanzavecchia, A., F. Sallusto. 2005. Understanding the generation and function of memory T cell subsets. Curr. Opin. Immunol. 17: 326-332. Niedbala, W., X. Wei, F. Y. Liew. 2002. IL-15 induces type 1 and type 2 CD4+ and CD8+ T cells proliferation but is unable to drive cytokine production in the absence of TCR activation or IL-12/IL-4 stimulation in vitro. Eur. J. Immunol. 32: 341-347. Strengell, M., S. Matikainen, J. Siren, A. Lehtonen, D. Foster, I. Julkunen, T. Sareneva. 2003. IL-21 in synergy with IL-15 or IL-18 enhances IFN-γ production in human NK and T cells. J. Immunol. 170: 5464-5469. Bofill, M., E. Almirall, A. McQuaid, R. Peña, R. Ruiz-Hernandez, M. Naranjo, L. Ruiz, B. Clotet, F. E. Borràs. 2004. Differential expression of the cytokine receptors for human interleukin (IL)-12 and IL-18 on lymphocytes of both CD45RA and CD45RO phenotype from tonsils, cord and adult peripheral blood. Clin. Exp. Immunol. 138: 460-465. Wigginton, J. M., R. H. Wiltrout. 2002. IL-12/IL-2 combination cytokine therapy for solid tumours: translation from bench to bedside. Expert Opin. Biol. Ther. 2: 513-524. Baluna, R., E. S. Vitetta. 1997. Vascular leak syndrome: a side effect of immunotherapy. Immunopharmacology 37: 117-132. Zhang, Y., J. P. Louboutin, J. Zhu, A. J. Rivera, S. G. Emerson. 2002. Preterminal host dendritic cells in irradiated mice prime CD8+ T cell-mediated acute graft-versus-host disease. J. Clin. Invest. 109: 1335-1344. Kambayashi, T., E. Assarsson, A. E. Lukacher, H.-G. Ljunggren, P. E. Jensen. 2003. Memory CD8+ T cells provide an early source of IFN-γ. J. Immunol. 170: 2399-2408. Wysocka, M., B. M. Benoit, S. Newton, L. Azzoni, L. J. Montaner, A. H. Rook. 2004. Enhancement of the host immune responses in cutaneous T-cell lymphoma by CpG oligodeoxynucleotides and IL-15. Blood 104: 4142-4149. Fehniger, T. A., H. Yu, M. A. Cooper, K. Suzuki, M. H. Shah, M. A. Caligiuri. 2000. Cutting edge: IL-15 costimulates the generalized Shwartzman reaction and innate immune IFN-γ production in vivo. J. Immunol. 164: 1643-1647. Tada, H., S. Aiba, K. Shibata, T. Ohteki, H. Takada. 2005. Synergistic effect of Nod1 and Nod2 agonists with Toll-like receptor agonists on human dendritic cells to generate interleukin-12 and T helper type 1 cells. Infect. Immun. 73: 7967-7976.